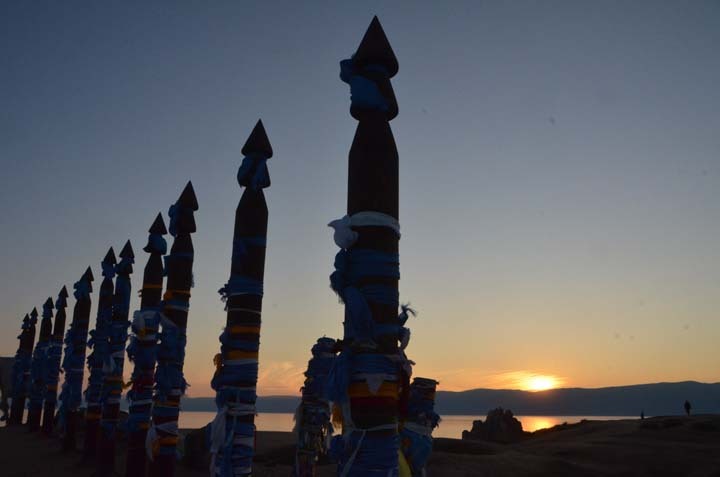 “For Buryats Lake Baikal is a sacred and holy place. 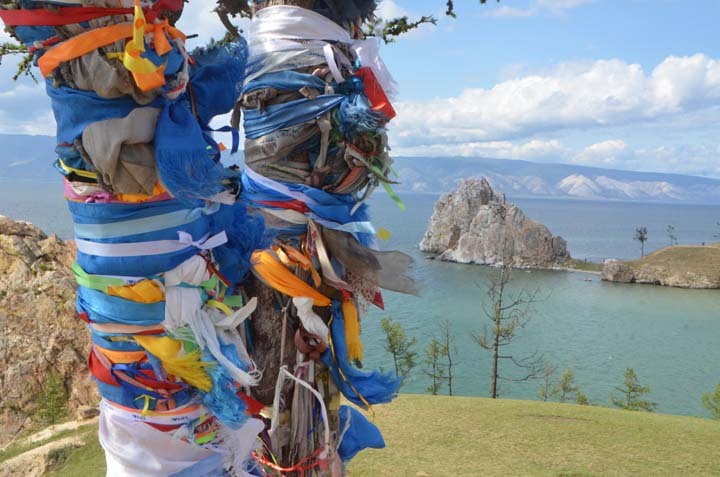 Historically, Baikal has given people food, fish, water, and there are many legends about Baikal,” says Masha Bambuyeva, a Buryat native of the north Baikal town of Severobaikalsk in Siberia, Russia. While travelling in Siberia and reporting on the area surrounding the world’s deepest, oldest, and most voluminous fresh water lake in the world, I have heard as many tales of Baikal myths as I have witnessed breathtaking landscapes. 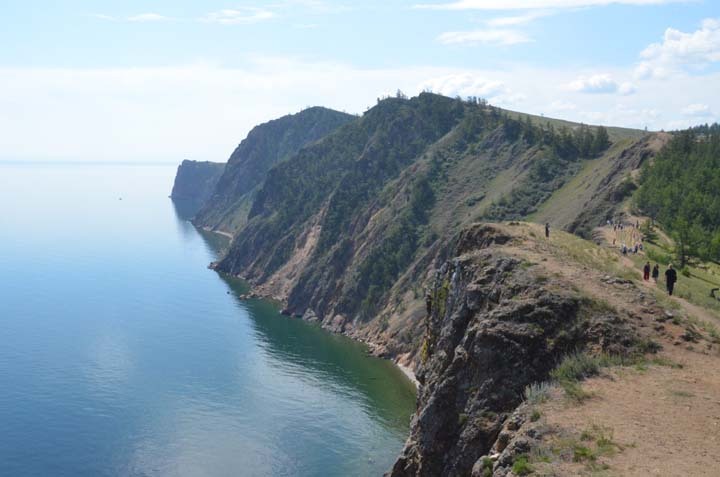 With the gorgeous scenery and peaceful solitude, one can imagine the effect Baikal had on its first settlers and inhabitants. It is not a reach to imagine that these settlers arrived during the short summer, but soon realized the harsh winter was just a price to pay in order to balance the gifts of the lake. But it’s more than just beauty and fish and freshwater. 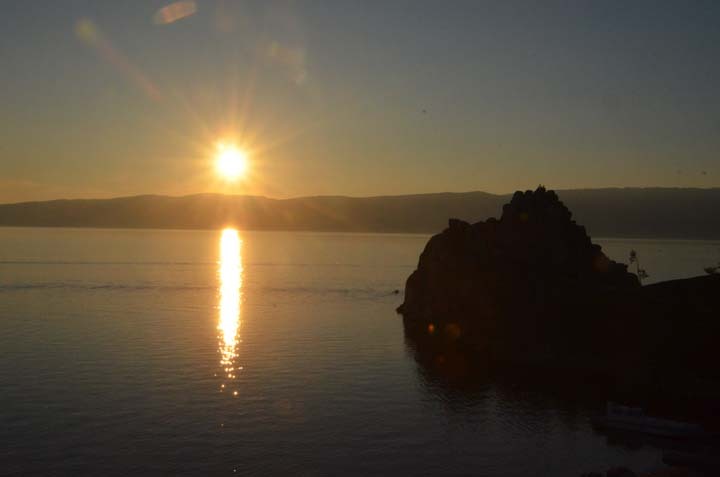 Everyone is talking about how Baikal has a strong energy; some say there is magic. Sergei Redkin, who lives in Irkutsk, Siberia’s capita, echoes this idea: “Every time I go to Baikal I feel its power. I don’t know how to say it with words, you can only feel it. Indeed, perhaps the romantic notions of magic auras and spiritual energy are too abstract or subjective for a modern, scientific mind to acknowledge. Nonetheless, the region has been inhabited by Buryats (an ethnic relative of Mongols) for centuries. The spirituality and religious customs of their culture are generally referred to as Shamanism and have distinct ties to the land. Though Russia’s predominant religion is Eastern Orthodox Christianity people who need help in life continue to be attracted to a naturalist philosophy in Siberia’s great Baikal. This has created a demand for Shamans, and, unfortunately, an economic calling for imposters. Constantine is from Angarsk, but works as a tour guide on the world’s third largest lake island, Olkhon. 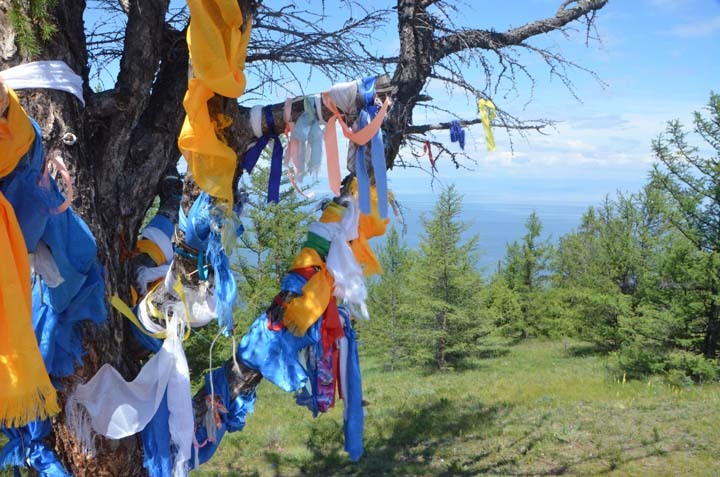 Olkhon is the Mecca of Shamanism in Siberia. Like many tourists to the region, Constantine is fascinated by Shamanism. He tells me that tourism has brought about false practices performed by the visitors at holy and sacred Shaman sites. It may be that people are captivated by the lake, and are willing to express their feelings of spirituality in any form that seems natural to them. Even non-believers of Shamanism aren’t willing to ignore the Shamans’ warnings. She then tells me that she knows that some of this Shamanism has worked, most notably on the Peak of Love. The Peak of Love cliff resembles a woman’s lower half with her legs spread wide like she’s giving birth. One knee is for boys. It’s more difficult to climb despite the path being paved by trampling believers. The other knee is deserted: it’s for girls. “I know people who have gone to this cliff and their wish has come true,” Ardnt reveals. The odds of one in two are admittedly primed for success. A different, more subtle and delicate Shaman practice, which requires keen observational skills of natural phenomenon, is more intriguing to the sceptic: weather prediction. Kristina Komaritsina lives in Severobaikalsk and works with Hidekel during the summers with Great Baikal Trail. She shares her firsthand experience of a Shaman practice. Just a reminder: Hidekel isn’t a Shaman, or claims to be. Actually, he is far from a believer. “You can predict sometimes the weather,” admits Hidekel. “You can put to work the schedule of the weather, this is the main thing,” he says. “It sounds crazy a bit, but if you feel it the level of intuition… if you know this place, like after five years, you know that after lunch will be rain because atmosphere takes all the water and it should run a little bit every day. If it doesn’t run for several days it means soon it will be huge rain. We had exactly that. “It’s mathematics, you know. Everything can be understood,” emphasizes the rational Hidekel. I witnessed his wind dance. He poked holes in a pea can and attached a string to it. He filled the can with burning acorns and proceeded to swing it around like a cowboy with a lasso. “This is an interactive thing,” Hidekel explains of the wind call. “If people start believing in this thing, not just you, but several people start looking at this ritual – it is mostly just ritual – but ritual will help to believe for several people. I think that if it works I can do it. Then he reveals the secret to his weather-predicting trick: “I started this activity by feeling my biorhythmic, and also by feeling nature, for example birds. Birds start activity before the rain comes or when the rain ends, they start singing or they start activity not very typical of them for time of day. Maybe it is somewhere in the mind, so I take this ritual tool and make it very quick and start doing this. I started this activity just like a bird, because I feel that something will be changed. 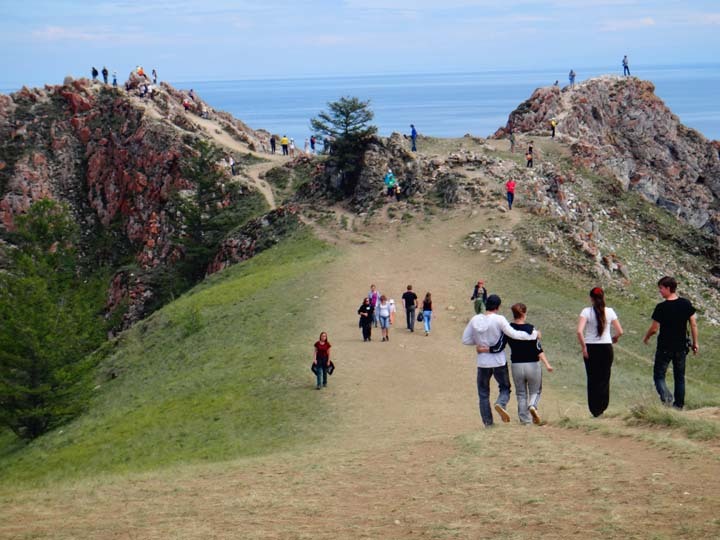 Baikal is known for spontaneous weather changes. He then tells me a legend about the three winds that cross near Olkhon. “So the legend has it that Sarma is a wild and pretty girl, Vekhovik and Barguzin are boys and they both like Sarma. They argue and quarrel for the heart of Sarma. They made a competition with each other: they put a barrel in the center of Baikal and see who can blow it to the other side. They compete to find out who is stronger. There are countless myths. Myths to explain various phenomena or simply the actions of animals. Komaritsina shares a story about bears. Upon coming to a view point on Olkhon, Ardnt points out a rock cliff shaped like a woman in profile. 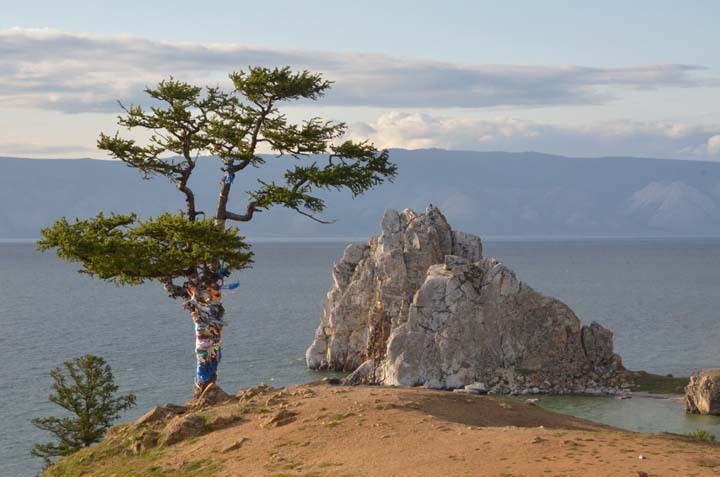 And lastly, Bambuyeva shares the well known myth about Lake Baikal and the Angara river. It is so well-known that there is a Russian ballet based on the tale. In Baikal, storytelling does not necessarily need a beautiful backdrop for its meaning and morals. However, as convenient tools, the surrounding landscapes and creatures help communicate the experience. “In the past Shamans used such beautiful places for their rituals, because the beauty of the place gives more power for the ritual,” Hidekel explains. The Swiss traveller, Achermann, enjoyed the myths as stories, but isn’t convinced of the spiritual aspect many others claim to experience. Hidekel came across as a bit cynical in belief earlier seems to change his postion somewhat. At the end of our interview, Hidekel seems to have relaxed his cynical tone. Maybe he is more on the fence about Shamanism then he likes to admit. The apparent phenomena surrounding the rituals seem to captivate even skeptics. “No reason why it stops. They check everything, nothing works. They sit down and one hour later the car just works, no problems. It can be dangerous. People start burning the wheels, the rubber in minus 35 degrees to heat themselves; it is very difficult. His last words may serve well as a warning or advice to the sceptic. Faith is primarily important. Faith starts working where Science ends.